Libcom.org's reading guide on the Italian social movements of the 1960s-70s, which saw massive strikes, protests, occupations, directly democratic assemblies and widespread radicalism across society. 1962-1973: Worker and student struggles in Italy - Sam Lowry - Short, simply-worded history of the wave of strikes and occupations that gripped Italian factories and universities during the 1960s. States of emergency: Cultures of revolt in Italy from 1968 to 1978 - Robert Lumley - Complete text of the definitive book on Italy's mass social movements of the 1960s and 70s tracing their development, growth, co-option and decline. Highly recommended. 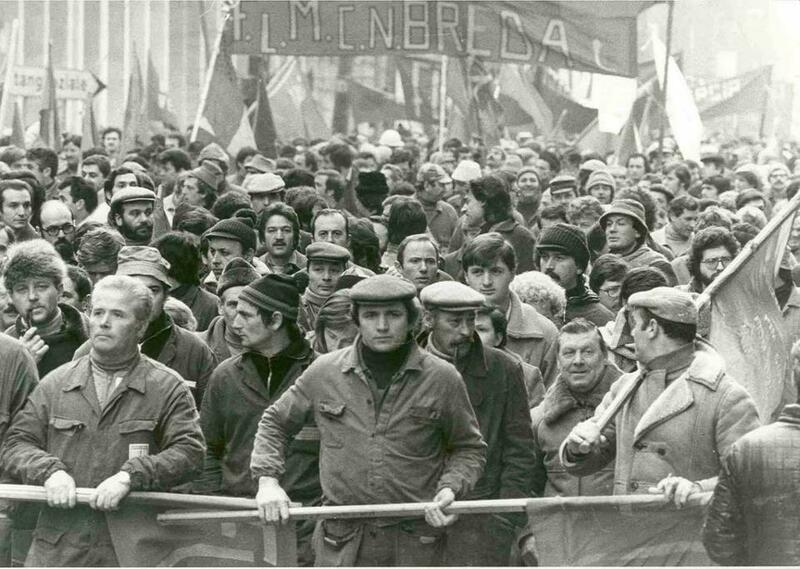 The Workerists and the unions in Italy's 'Hot Autumn' - Steve Wright - A brief history of the Italian 'Workerists' in the 'Hot Autumn' of 1969, when unions succeeded in co-opting radical working class demands. Extract from the excellent and highly recommended book Storming Heaven. Italy 1977-8: Living with an earthquake - Red Notes - Collection of articles, speeches and letters from Italy at a time of intense class struggle, giving an insider's account of the social movement and its struggles against the established left. Lotta Continua - Arguably the most important extra-parliamentary organisation of the 1970s in Italy. Potere Operaio - Autonomist Marxist group basing theory on the everyday life of workers and their refusal of work. Antonio Negri - Autonomist Marxist academic and leader of Potere Operaio, wrongfully imprisoned for alleged involvement in the Brigate Rosse urban guerrilla group. Mario Tronti - Highly influential Marxist philosopher, considered to be one of the founders of autonomist thought. Mariarosa Dalla Costa - Marxist feminist famous for arguing that women's unwaged labour is an essential part of capitalist reproduction, rather than merely an oppression imposed on women by men. Silvia Federici - Marxist feminist writer drawing the links between capitalism's need for women's unpaid labour and the subjugation of women under patriarchy. Sergio Bologna - veteran Italian autonomist intellectual and activist. Raniero Panzieri - Co-founder of the early operaist journal Quaderni Rossi, and translator of the second volume of Marx' Capital into Italian. Porto Marghera – the last firebrands - Booklet on the widespread class struggle in the chemical factories of the Italian industrial zone of Porto Marghera in the 1960s and 70s. Against the state as boss: Autonomous Assembly of Alfa Romeo - A fascinating first person account of workers' struggles at Italian state-owned car manufacturer, Alfa Romeo from 1971-1972. Italian feminism, workerism and autonomy in the 1970s: The struggle against unpaid reproductive labour and violence - Patrick Cuninghame - Article about the autonomous women's movement in Italy in the 1970s, with particular focus on Wages for Housework and Lotta Femminista. Fighting For Feminism: The Womens Question in an Italian Revolutionary Group - A set of letters from the Lotta Continua newspaper discussing the relationship between feminism, Marxism, the women's movement, and Lotta Continua. Take over the city - Community struggle in Italy, 1973 - Excellent article about community struggles across Italy, including rent strikes and occupations of empty housing. The working class struggle against the crisis: self-reduction of prices in Italy, 1975 - Bruno Ramirez - Bruno Ramirez's analysis of "the refusal to comply with price increases of essential services", also known as 'self-reduction'. Strategy of tension - A short introduction to the government's "strategy of tension" program, to use fascist groups to carry out terrorist attacks which would then be blamed on anarchists and the left. Operation Gladio - A short introduction to Operation Gladio, the secret neofascist army set up with NATO support to combat internal subversion. Secrets and bombs: The Piazza Fontana bombing and the strategy of tension - Detailed, book-length history of the strategy of tension. Hot Autumn photo gallery, Italy 1969 - Photos of strikes, demonstrations, occupations and mass assemblies of workers and students from Italy's 'Hot Autumn' of 1969. Also includes photos from the funeral of anarchist Giuseppe Pinelli, who had been murdered by police earlier that year. Antonio Negri: a revolt that never ends - Documentary about the life and ideas of Italian Marxist Antonio Negri. With interesting footage from Italy in the 1960s-70s explains his development from the 'Operaisti' through his trial for supposed involvement in the Red Brigades up to today. Accidental death of an anarchist - Dario Fo - Dario Fo's best known play, based on the events surrounding Giuseppe Pinelli's death after he was arrested on suspicion of planting a bomb in Piazza Fontana, Milan, in 1969. The Unseen - Nanni Balestrini - Novel looking at the Italian Autonomia movement of the 1960s-70s through the eyes of a single working-class protagonist, from high-school rebellion, squatting, setting up a free radio station to arrest and the brutalities of imprisonment. Two Short Stories - Nanni Balestrini - The first story, Let a thousand hands reach out to pick up the gun, is a montage of newspaper reports of the death of Mara Cagol, one of the founders of the Red Brigades. The second, FIAT, is a first-hand account of work (or its refusal) at the infamous FIAT plant in Turin, Italy. 'La classe operaia va in paradiso' (The working class goes to heaven) - Excellent film from 1971 depicting a factory worker's realisation of his condition as a "tool" in the process of production and his struggle against work, alienation and his own trade union. 'Lavorare con lentezza' (Work slowly) - Film by the Wu-Ming Collective against the backdrop of 1970s Bologna, in which two young men become involved in the city's famous radical pirate radio station, Radio Alice.